ELV, being on the far side of fifty, doesn’t know exactly what the term “keeping it real” means. Does it mean staying true to oneself? To your roots? To your metier? Is it maintaining your badge of authenticity, when forces conspire to lessen or weaken your commitment to excellence? Or is it, as Dave Chappelle maintains, simply an excuse for letting your baser instincts get in the way of your best interests? That last statement has absolutely nothing to do with Bouchon, Thomas Keller, food, restaurants or this posting, but it does give ELV the excuse to run a Dave Chappelle video. Whatever “keeping it real” means, we at ELV are pretty darn sure that’s what Bouchon does every day. One bite of the food will convince you of that, even if you are unaware of Keller’s maniacal devotion to detail, and slavish attention to the finer points of French food. Bouchon is one of only a handful of Vegas restaurants that does its own baking, and from the first bite of a sourdough roll put before you — slathered with Echire butter of course — you know you’re in for something special no matter what you order. Ordering wasn’t a problem for us the other day, because we were dining with uber-photog Sabin Orr — known for his luscious food photos and the only guy in town who might get better treatment in restaurants than ELV. It seems Sabin is shooting a behind-the-scenes book about Bouchon, so when we arrived, he was already in the kitchen, kibbitzing with the cooks, and arranging for a modest repast to be placed before us. And by “modest repast” we mean virtually everything on the Saturday brunch menu. You name it, we ate it. Everything from wild mushroom ravioli to ile flottane (eggs in snow aka floating island) was placed before us, and all of it was drop your fork delicious. Yeah, that’s how good they are. For the uninitiated, chicken and waffles is a soul food staple, popularized by Roscoe’s House of Chicken and Waffles in L.A.. Quite frankly, neither ELV nor his staff thought white people knew how to make them. But make them sous chef Bruno Morabito and his crew do on weekends — taking this southern staple to a new standard of succulence by bringing a sauce chasseur (hunter’s sauce) to the table for the chicken, along with superb maple syrup for the waffles. Then, like a baseball that keeps getting larger, it hit us: this is how Thomas keeps it real. By cooking soul food. The French way. Its good there, but why do they have crappy bottled OJ rather than the fresh stuff for breakfast? 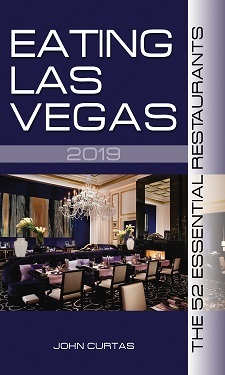 This restaurant is absolutely our number one place to dine when we are in Las Vegas. Their breakfast offerings are incredible. Bouchon in Vegas is,without doubt, the finest restaurant at which I’ve ever dined! Ten thumbs up!!!! !